Today, we leave the verdant green cliffs of Heimay Island for the snow and windblown summit of Iceland’s tallest active volcano: Mount Hekla. The first step in the journey was getting back to Iceland proper. We awoke early, had breakfast, and said goodbye to our hosts Heather and her children. The weather was beautiful, providing a spectacular ferry ride back to the mainland. As we sat on the deck of the ferry enjoying the view, we could see Mt. 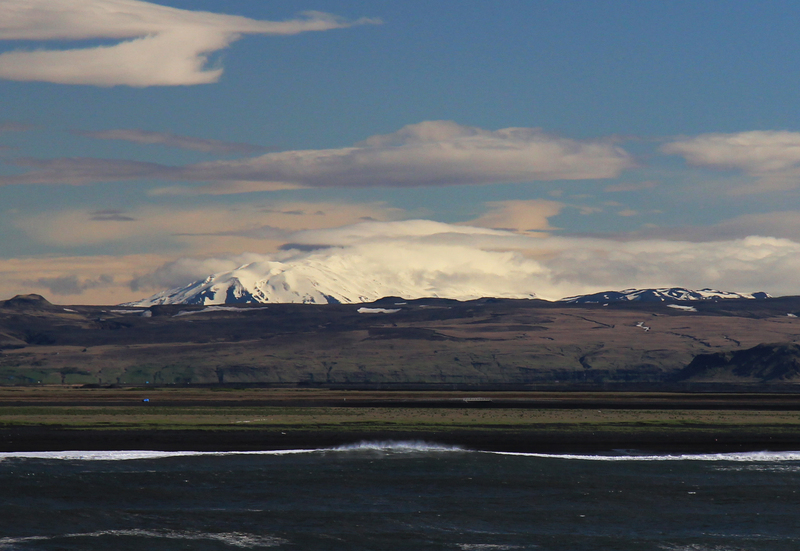 Hekla out in the distance, beckoning us to visit its slopes. By sheer coincidence, we started talking with a resident from Vestmannaeyjar who just so happened to be going on the same tour as we were. He said he had driven and hiked near and around Mt. Hekla several times before, but had never been to the top. Instead of climbing, which would have probably taken us a couple of days to reach the summit, we’re heading to the top of Mt. Hekla via snowcat. We met our driver and guide Erlingur of Top Tours in the town of Hella. He was easy to find: He was the one driving a big diesel flatbed truck with a snowcat on the back. could handle the road conditions. There were six of us going in the snowcat, including a French couple who just happened to be hanging around the trailhead, and asked to join the tour. The base of Mt. 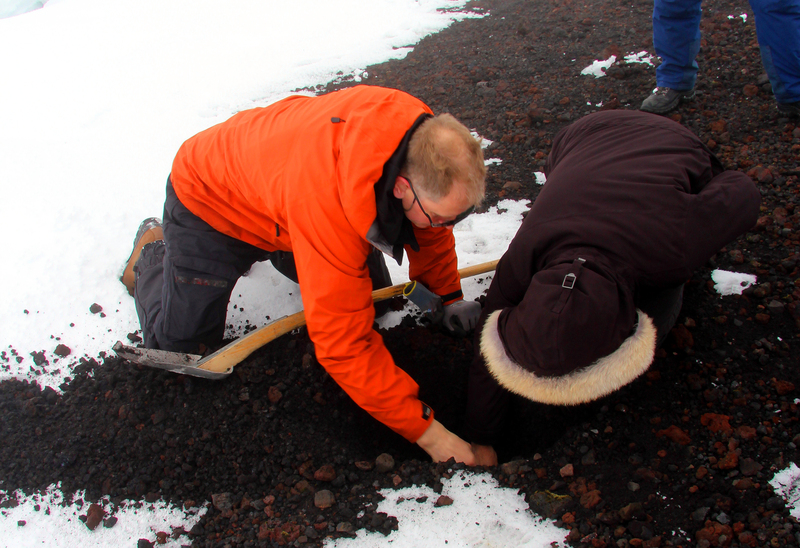 Hekla is surrounded by old lava fields from multiple eruptions over the last couple of hundred years. 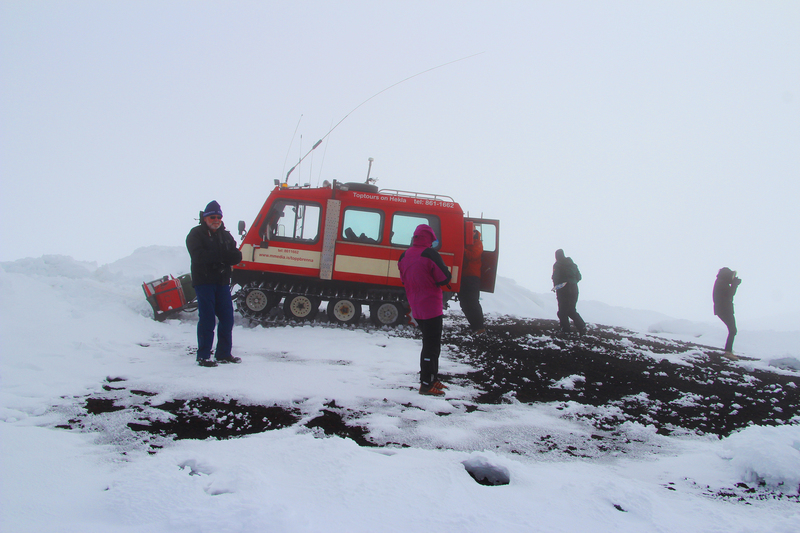 We drove the snowcat down an old road through the lava fields before finally ascending the snowfields of the mountain. At first, the snowcat seemed to effortlessly ascend the snowfields. But, as the morning went on, the warm weather starting softening up the snowpack, causing the snowcat to sink deeper into the snow and making it difficult to climb. It got to the point where Erlingur had to very gradually zigzag up the snowfields, instead of going straight up. This made climbing a very slow process. We made several stops along the way to the summit, allowing Erlingur to assess the route, and for us to stretch our legs and take in the magnificent view of the surrounding countryside. As we continued up the mountain, the snow got so mushy that we started wondering if we were ever going to be able to get to Hekla summit. About two-thirds of the way up we caught a break: A cloud cap near the top blocked out most of the sun, keeping the snow nice and hard. All of sudden, our little snowcat was flying straight up the mountain. The summit of Mount Hekla was cold, windy, and foggy. We could barely see the edges of the volcanic crater and it was too cloudy to see much into its deep interior. 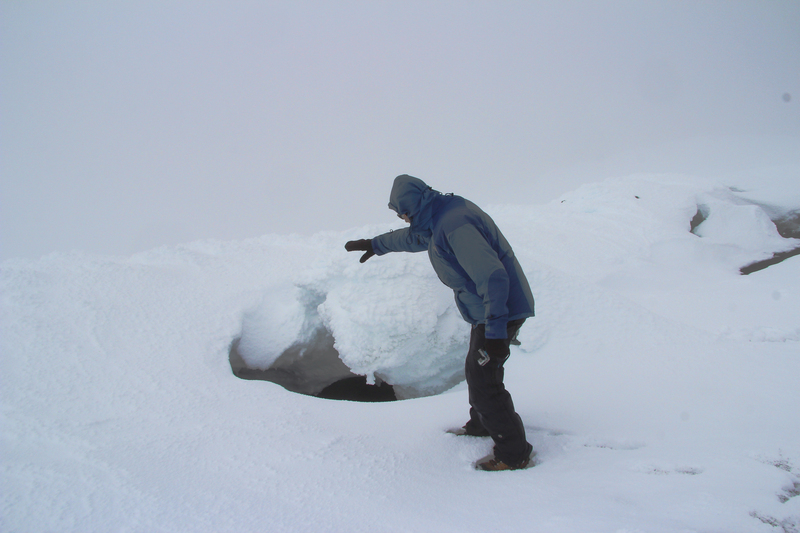 Still, we knew we were sitting on an active volcano: Steam vents formed dramatic ice caves in the snow. Erlingur dug a small hole in the ground where we took turns feeling how warm the ground was inside the hole. Mt. Hekla is still very active. In fact, it had been predicted to erupt a couple of months before our arrival; thankfully, the eruption never happened. Still, it could, and will, let loose its fury in the very near future. I’m just glad the mountain decided to remain in its slumber while visited. 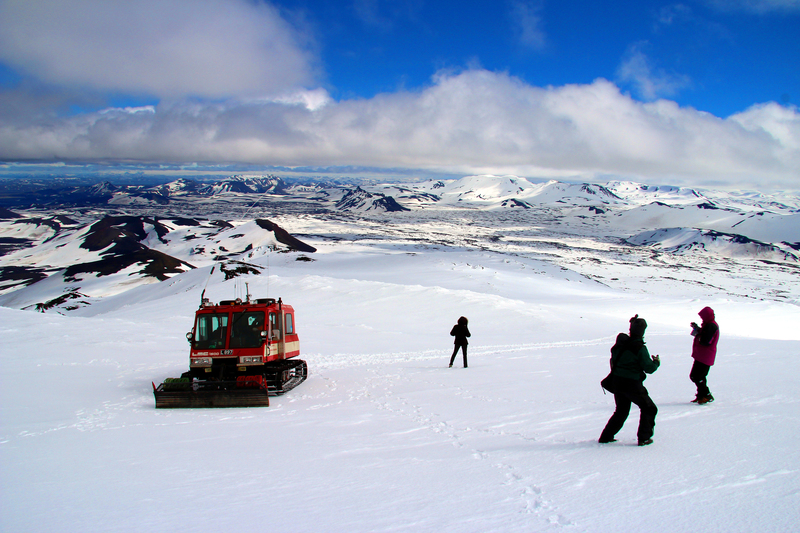 Riding a snowcat to the top of an active volcano is one of the many adventurous activities you can do in South Iceland. There are several touring companies that will take you to interesting places, like active volcanoes, for a very expensive price. Adventure tours, like just about everything else in Iceland, are very expensive. However, I would very much recommend Erlingur’s company TopTours as he provided a great experience, and his prices were nearly half of what other operators were charging for similar tours. 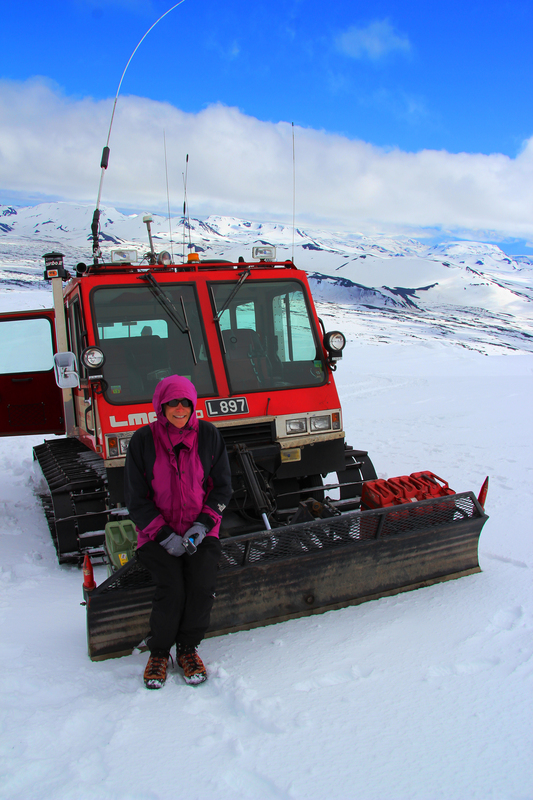 This entry was posted in International Travel and tagged Hekla, iceland, Mount Hekla, snowcat, South Iceland, TopTours, volcano. Bookmark the permalink.